Need help with you air conditioning or heating system? Look no further. The HVAC experts at Jones Plumbing & Heating Inc are here to help you today. We have the training and experience necessary to handle all sorts of heating and air conditioning issues for all brands of heating and air equipment. We’re not limited to repairs either. 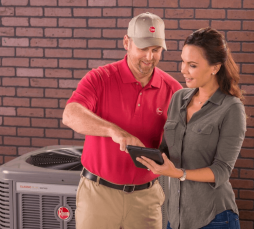 Our HVAC technicians can help you with service, maintenance, replacement or installation of heating and air conditioning equipment for your home or office. Our team at Jones Plumbing & Heating Inc is dedicated to providing our customers with the highest quality service, parts and equipment possible at reasonable prices. We look forward to adding you to our growing list of satisfied customers. Jones Plumbing & Heating Inc is proud to serve or local community. We can be reached by phone at (308) 324-3333 or through the contact form here on our website.